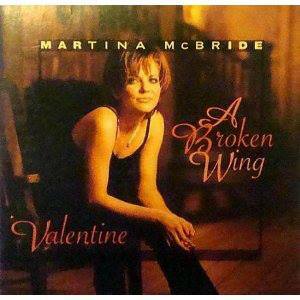 Martina McBride (born July 29, 1966) is an American country music singer and songwriter. McBride has been called the "Celine Dion of Country Music" for her big-voiced ballads and soprano range. McBride was signed to RCA Records in 1991, and made her debut the following year as a neo-traditionalist country singer with the single, "The Time Has Come." Over time, she developed a pop-styled crossover sound, similar to that of Faith Hill and Shania Twain, and has had a string of major hit singles on the Billboard country chart and occasionally on the adult contemporary chart. Five of these singles went to No. 1 on the country chart between 1995 and 2001, and one peaked at No. 1 on the adult contemporary chart in 2003.